The Golden Poppy, (Eschscholtzia californica,) also known as the flame flower, la amapola, and copa de oro (cup of gold), became the state flower in 1903. Though the act stopped short of naming a particular species, the California poppy (Eschscholzia californica) is thought of as the official state flower. The poppy grows wild throughout California. Every year April 6 is California Poppy Day, and Governor Wilson proclaimed May 13-18, 1996, Poppy Week. 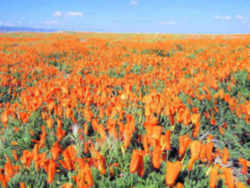 California Indians cherished the poppy as both a source of food and for oil extracted from the plant. The Golden Poppy botanical name, (Eschsholtzia californica,) was given by Adelbert Von Chamisso, a naturalist and member of the Prussian Academy of Sciences, who dropped anchor in San Francisco in 1816 in a bay surrounded by hills of the golden flowers. More than a hundred years ago on December 12, 1890, the California State Floral Society cast their votes to designate an official flower for California. 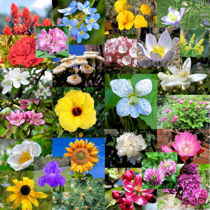 The three flowers to be voted upon included the California poppy (Eschscholzia californica), the Mariposa lily (Calochortus), and the Matilija poppy (Romneya coulteri). Only three persons voted for the Mariposa Lily, whereas no votes were cast for the Matilija Poppy (often called the giant poppy). 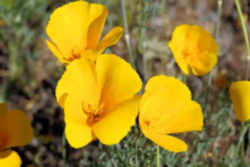 Consequently, the California Poppy won the esteemed title of "Official California State Flower" by an overwhelming landslide. Research shows that the California Poppy had been first depicted more than 70 years earlier, and that it had a horticultural history of approximately 64 years. It seems very fitting to me that this state's official flower is golden in color. 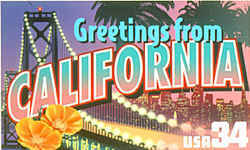 For who doesn't associate "gold" with California? And who doesn't recall the many tales that have been told--some true, others perhaps fable--about the great California Gold Rush! 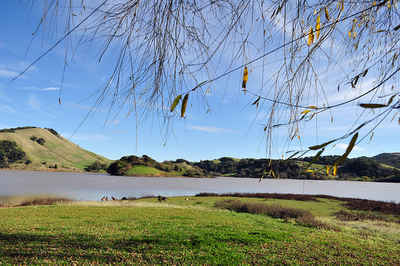 Then there is California's renown nickname of "The Golden State" - making one think of sunshine and golden sandy beaches! Eschscholzia californica is a species of flowering plant in the family Papaveraceae, native to the United States and Mexico, and the official state flower of California. It is a perennial or annual growing to 5-60 in (13-152 cm) tall, with alternately branching glaucous blue-green foliage. The leaves are ternately divided into round, lobed segments. The flowers are solitary on long stems, silky-textured, with four petals, each petal 2 to 6 cm (0.79 to 2.36 in) long and broad; flower color ranges from yellow to orange, with flowering from February to September. The petals close at night or in cold, windy weather and open again the following morning, although they may remain closed in cloudy weather. The fruit is a slender, dehiscent capsule 3 to 9 cm (1.2 to 3.5 in) long, which splits in two to release the numerous small black or dark brown seeds. It survives mild winters in its native range, dying completely in colder climates. It is possible to use this flower in landscaping for a temporary spring display by scattering the seed in the fall. Once established it will self seed. Some yards in Tucson are covered in a bright gold mass of these flowers each spring. There seems to be some confusion about the scientific name for this flower, various texts list this flower as Eschscholtzia californica var mexicana or Eschscholtzia mexicana. They can't even agree on the spelling of Eschscholtzia, spelling it with and without a 't'. Eschscholtzia or Eschscholzia?